The parents of ill baby Charlie Gard who want to take their son to the US for treatment are bidding to take their case to the Supreme Court. Chris Gard and Connie Yates failed in their appeal against a High Court ruling that the eight-month-old should be moved to palliative care. Lawyers representing the couple say they will now ask Supreme Court justices to analyse the case. Charlie has mitochondrial depletion syndrome, a disorder that affects the genetic building blocks that give energy to cells. Great Ormond Street Hospital said it has left him was unable to see, hear, make a noise or move. Charlie's parents, from Bedfont, west London, had asked three Court of Appeal judges to overturn Mr Justice Francis's decision. But Lord Justice McFarlane, Lady Justice King and Lord Justice Sales, who analysed evidence at a hearing in London on Tuesday, have upheld the ruling. Richard Gordon QC, who led Charlie's parents' legal team, told appeal judges they "wish to exhaust all possible options". 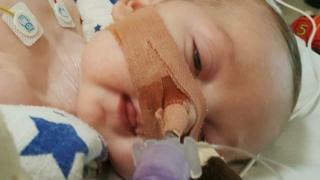 The hospital said Charlie was "a terminally-ill child" whose health was "deteriorating day by day". A spokesman said: "We explored the request to use a therapy that had not been used before and sought independent, international medical opinions on what would represent the best possible treatment for Charlie. "The medical and legal consensus, confirmed by the ruling, is that it is in Charlie's best interests to be allowed to die with dignity." The barrister for Great Ormond Street said hospital clinicians felt they were "at the borders of what is ethical" but confirmed treatment would not be withdrawn over the Bank Holiday weekend.